Great directions (make sure you turn right after the picnic area) and an easy walk, takes about an hour and a half. Allow about 2 hours for this undulating and at times hilly walk. The walk follows public footpaths and bridleways which cross private land. Leave Box Hill and Westhumble station car park by steps then turn left up road. Cross road at railway bridge and take footpath on right alongside the railway. Go through gate to enter the Norbury Park Estate and continue ahead with fence on right to reach footbridge across the River Mole.The London, Brighton and South Coast Railway Company opened the Dorking to Leatherhead line in 1867 and Boxhill and Westhumble Station has been popular with walkers throughout the years.Notice the corkscrew brickwork that was used to build the arches of the railway bridge to the right of the footbridge. Cross the footbridge, go along path and through kissing gate into field. Continue ahead for 50 m then bear left across field toward kissing gate in front of cottage. Go through gate and bear right to follow track to junction near a farmyard. Turn left and follow surfaced track to bridge over the River Mole.The River Mole flows north-westwards through Surrey to join the River Thames opposite Hampton Court Palace in London. There is a wide range of wildlife along this stretch of the Mole and you may catch a glimpse of a heron of kingfisher. Continue along track towards Lodge Farm. Before the farm buildings turn left then right to follow track between fences, keeping buildings on right, to reach gate at picnic site. Pass through gate and continue ahead, crossing gate to reach track. Bear right and follow track to reach T-Junction.The area in front of you is a long-established arboretum, which contains some majestic Cedar of Lebanon. Turn left and, ignoring track on right, take steep track up hill with trees on left. Proceed to top of slope to reach fence on left. For an excellent view of Box Hill, the North Downs and the Mole Gap, take track on left to the viewpoint, then return. Continue ahead with fence on left, past gates to reach surfaced drive. Turn left along track to pass Norbury Park House on left. 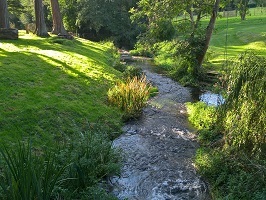 Norbury Park is situated on the north side of Mickleham and it is believed to have existed since before the Domesday survey. William Lock bought Norbury in 1774 and had the mansion built in the crest of the hill commanding beautiful scenery. The mansion was added to in 1820. 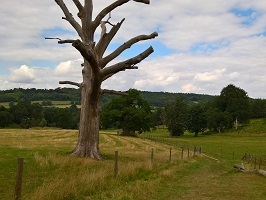 Norbury Park estate was the first open space to be purchased by Surrey County Council, in 1930. 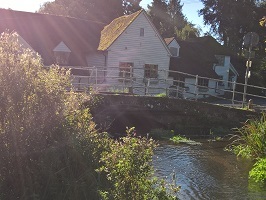 It is managed by Surrey Wildlife Trust Countryside Services Ltd and has an area designated as a Site of Special Scientific Interest. Particular features of the estate are the very old yew trees.Continue ahead along drive to junction. Bear left, still with fence on left passing Norbury Park Sawmill on your right and follow surfaced drive for 1km to junction with track at bend. Bear right along track to reach road at parking area. (For a shorter walk turn left down Crabtree Lane to return to Box Hill and Westhumble Station) Turn right along road for 200 m to stile on left. Cross stile and bear left across field, crossing stile into wood. Follow path to cattle barrier. Cross barrier and continue ahead down field edge, with fence on left, through gateway to road. Turn left and walk along verge to reach track on right. Cross road and follow track with ruined building on left. The ruins are the Wets wall and gable and part of the east wall of Westhumble Chapel. The small, rectangular chapel was built of flint in the late 12th or 13th century for the use of the villagers of West Humble, but was desecrated some 3 centuries later. The remains were handed over to the care of the National Trust in 1937 and the chapel is now a scheduled Ancient monument. After 120m go through small gate on left and follow path between fences through gate to road. Turn right and follow road to junction, then bear right along Adlers Lane. Go straight ahead at crossroads, then after 80m turn left along narrow path with house called Milton on right and continue ahead to reach road. Turn right and follow the path parallel to road. When the path rejoins the road there is an archway to the left.The archway was built in 1923 over Camilla Drive and has a plaque on it commemorating the novelist Fanny Burney. She was a family friend of the Locks and spent many days at their home, Norbury Park House, drinking in “the contentment which Norbury Park seems to have gathered from all corners of the world”. In 1793 Fanny married General Alexandre d’Arblay at nearby Mickleham church. He was one of a group of French monarchists who were living in Mickleham having fled from the French Revolution. Later the Locks leased them a small plot of land on the Norbury Park estate and the couple decided to build a permanent house. Fanny’s third novel, ‘Camilla’ brought in enough money to pay for the building which was called ‘Camilla Cottage’. Next to the archway is Westhumble’s present chapel, dedicated to St Michael. Walk courtesy of Surrey County Council.